During a ceremony in the Swedish Parliament today, Chile’s President Michelle Bachelet, handed over a bust of the Swedish diplomat, Harald Edelstam, thanking for his humanitarian deeds during the coup in Chile in 1973, where he saved more than 1.500 lives. 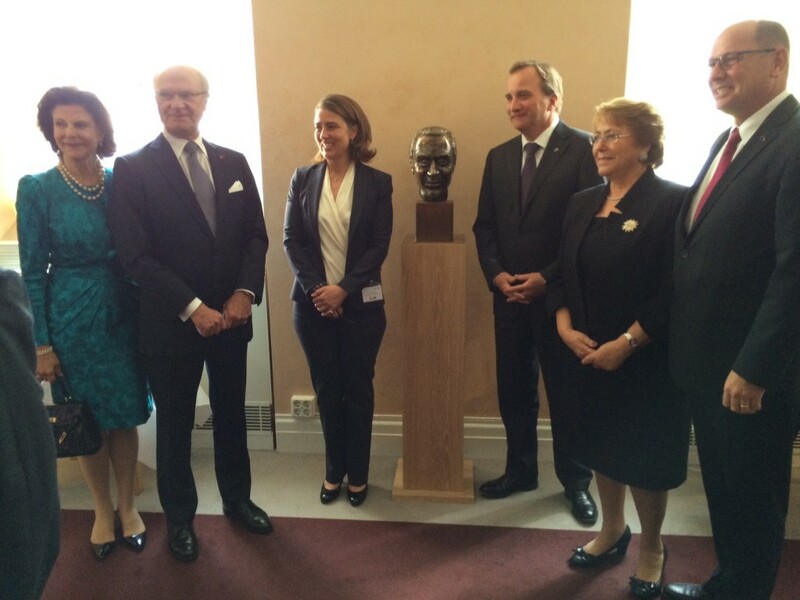 Artist of the bust of Harald Edelstam, Mr. Luciano Escanilla, Prime Minister of Sweden, Mr. Stefan Löfven, President of Chile, Ms. Michelle Bachelet, and Ms. Caroline Edelstam, President of Edelstam Foundation. 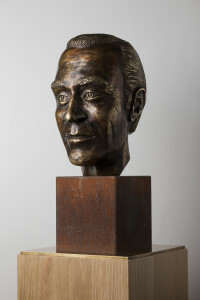 Bust of Harald Edelstam given by Chile’s government to the Swedish Parliament May 11, 2016.
place in history for the friendship they have shown to other nations. 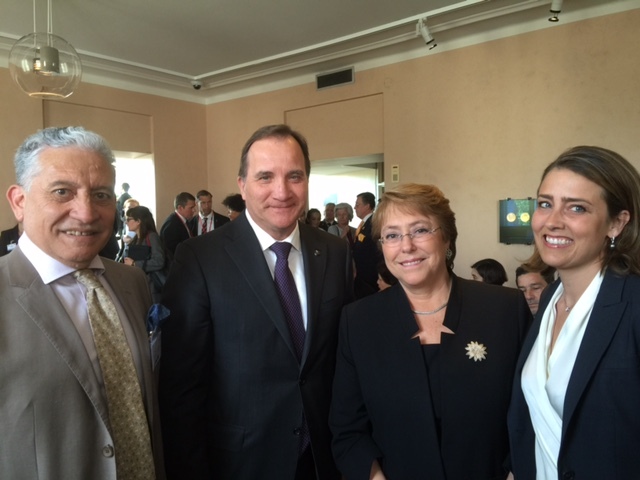 Together with Harald Edelstam, they have all contributed to the efforts Sweden has made in the world for human rights and peace,” says Chile’s President, Michelle Bachelet. The diplomat and the Ambassador Harald Edelstam (1913-1989) is best known for having saved the lives of a large number of people during and after General Augusto Pinochet’s military coup in Chile in 1973. Edelstam is known for during the latter part of World War II having saved the lives of hundreds of Norwegian resistance fighters and Jews in Nazi-occupied Norway. He distinguished himself as diplomat by his professional competence, his bravery and his civic courage in the fight for Human Rights. He was an early proponent and symbol of what is today known as the ”Responsibility to Protect” and his memorable acts contributed to save more than a thousand lives. ”It feels important that my grandfather is honored for all the persons that have my grandfather to thank for their lives and for those who have him as a role model. Further, it contributes to inspire people to show civic courage in difficult, exposed situations, and also to take leadership within the defence of human rights. Moreover, it feels important that the Swedish government accepts this gift,” says Caroline Edelstam, granddaughter to Harald Edelstam and co-founder of the Edelstam Foundation. Chile has previously honored Harald Edelstam posthumously in 1993 with the Order of Bernardo O’Higgins, the highest civilian honor awarded to non-Chilean citizens. Former President of Chile, Mr. Patricio Aylwin, awarded the order to Harald Edelstam’s granddaughter during a ceremony in the Concert Hall of Stockholm. Further, in 2009, the Parliament in Chile held a ceremony in the Chamber of Deputies in plenary to honor Harald Edelstam and all parties attended together with a delegation including Caroline Edelstam from the Edelstam Foundation. In connection with this, President Michelle Bachelet signed an appeal to support the Edelstam Prize. Their Majesties, King and Queen of Sweden, Ms. Caroline Edelstam, granddaughter of Harald Edelstam and President of the Edelstam Foundation, the Prime Minister of Sweden, Mr. Stefan Löfven, President of Chile, Ms. Michelle Bachelet, and Speaker of the Parliament, Mr. Urban Ahlin. The Edelstam Foundation administrates the Edelstam Prize awarded for outstanding contributions and exceptional courage in standing up for one’s beliefs in the Defence of Human Rights. Further, the Edelstam Foundation encourages civic courage in Ambassador Harald Edelstam’s spirit, works with formation of opinion and advocacy, education and information, research, and observation within the Defence of Human Rights. The Edelstam Foundation stands for a humanistic view, based on the values and principles that mainly are expressed in the United Nations’ Declaration on Human Rights from 1948, along with the conventions that followed and internationally accepted public law. The Foundation is a politically and religiously independent organization. The international jury is chaired by Caroline Edelstam, Harald Edelstam’s granddaughter and co-founder of the Edelstam Foundation. Other members of the Jury are Justice Louise Arbour, former UN High Commissioner of Human Rights represents the North Americas, Judge Shirin Ebadi, Nobel Peace Prize Winner in 2003 represents Asia; Africa is represented by Dr. Pascoal Mocumbi, former Prime Minister of Mozambique (1994-2004). Professor Philip Alston, UN’s Special Rapporteur on extrajudicial, summary or arbitrary executions represents Oceania. Latin America is represented by former first Prosecutor of the International Criminal Court (ICC), Dr. Luis Moreno Ocampo. Europe is represented by former Judge Baltasar Garzón, who served on Spain’s Criminal Chamber of the National Court of Spain who is consistently fighting for Human Rights. Baltasar Garzón is most famous for indicting the Chilean dictator, General Augusto Pinochet for the deaths and torture of thousands of victims from Chile and other countries.